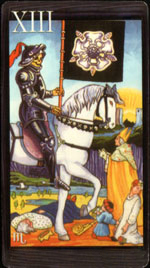 The card illustrates a skeleton riding on horseback and holding a black flag with a white rose. It is a symbol of inseparability of life and death. There are dead and dying people (child, maiden and bishop) around the skeleton. However scary this card might look at first sight, it’s not a negative card, so no need to be worried. You’ve completed another stage in your life, soon you’ll raise a new identity, your thoughts and visions will change and you’ll probably find new friends. The one thing that doesn’t change is your soul – it moves with you from one stage to another. There are serious changes ahead of you that could radically change your whole life. One stage of your life is replaced by another. Such major changes by their nature are rarely negative. Meet them with courage and then any change won’t be a bother to you. The forthcoming renovation of the individuality. This is a chance for something new, a symbol of changes. You can find out what are the changes relying on cards next to the Death card. Additional Card Meanings: Parting, purification. Fear of changes, stagnation in business and forced work. If there are good cards next to this card – it means a slow movement towards changes. Regarding person’s character it means restless, unbalanced nature or simply an inability to finish plans with a logical solution. Release yourself from the old. Don’t make any step that has no future. Today, you’ll finish something or something will just end. Maybe you’ll be glad that “it” finally ended, and perhaps you will be sorry to part with something that meant so much to you. In any case, be ready to say goodbye to the past. Don’t try to save or revive it. Let it go away, and in the end you’ll feel a relief, even if at first it was hard. This year could mean an important step in your life. Something will end, will lose its meaning or form, and you have to say goodbye to it in order to make room for new things. Get rid of bad habits at last and let go of the things that no longer bring you any good. If you will be sorry to part with it or if the future seems very uncertain, be patient – those are completely normal human feelings, which you shouldn’t suppress. I just signed up to your site rss feed. Will you post more on tarot cards and spreads? Definitely! We are working hard to develop the tarot section of PaganGate. You will be seeing much more articles in the near future.